Today id like to share some images that I recently created. At present I shoot products in my dining room, which is not ideal. I am currently on the look out for a suitable space, If anyone has any suggestions or has a space I can use / share in the Lytham St Annes / Blackpool / Lancashire area then please use the contact page and let me know. Couple of examples of my work in use. Today thought id she a couple of my images and how varied their usages can be. The above image was taken back in 2009, on my first Dslr camera, an old Nikon D90. In comparison today, my iPhone can take better images. This image of a street in Manchester has been purchased for the front cover of a fiction crime novel by the talented author Bill Rogers. His publishers added the people and colour graded the image, but it is nice to see an image of mine in print. The following image was taken around 4 years ago. Just having a stroll through a cold windy Blackpool, and I liked the way the low sun was creating shadows and so took a quick snap of the Mrs and the little one in the push chair. The Guardian New paper purchased the image to use as a thumbnail, one on of their stories about single mothers. The story was then taken off the Guardian website and used on many "mums blogs"
My images are sold either directly, or through the stock site Alamy. Once a sale occurs I am not privy to who the customer is, but with the powerful tools around, like googles reverse image search it is nice to find my images around the internet. Another trip up Blackpool tower. Hello, id like to share some images from another trip working up Blackpool's tower, repairing the illumination lighting at great height. Arrived to site early and so I walked the long way there. Was surprised to see early morning council worker cleaning the front. Ropes set, and decent underway. Always told "don't look down" but you have to in this game. Today repairs ongoing to the heart light. Sophisticated control gear, power the lighting on the Tower, helps it to change colour and be programmable. A spectator while working at height. Today marks the final post in this series. It finishes with the big finale - the heavy lift of the accommodation module. Project manager looks on with anticipation. Nearly 3000 tonnes being lifted, which is effortless for the Saipem S7000. With additional tugger lines fitter, the huge load can be rotated on its axis and and with great prescission laid onto the deck of the S7000. I hope that this series of blog posts over the last few months, have been of interest. I have been working in the oil and gas industry for nearly 15 years and this has certainly been the most interesting project I have been involved in. The decommissioning of North Sea oil and gas platforms are unfortunately something that we are going to see much more, as the price of oil falls, and the platforms are becoming a less viable option to maintain and keep running. Today id like to show, the first couple of lifts. Above image the rope access riggers, install the cranes lifting equipment. Once landed the derrick is then sea fastened (welded) to the deck of the S7000. The next lift to be completed was the helideck. It was amazing to see these huge bits of an oil rig, look almost insignificant against the huge Saipem S7000 cranes. With its state-of-the-art J-lay tower, upgraded dynamic positioning capability and fast ballasting system, the Saipem 7000 semisubmersible crane vessel has the capacity to handle the entire workscope of offshore construction developments worldwide, encompassing pipelaying in water depths greater than 2,000 metres and heavy lift operations up to 14,000 tonnes. The vessel’s Class 3 DP system of 12 thrusters ensures that the vessel maintains good station keeping in the most difficult of weather conditions. Additionally, because the Saipem 7000 has accommodation facilities up to 725 people, the vessel can assist hook-up and commissioning as well as initial platform life support activities. Altogether, this high specification means that the Saipem 7000 can be counted on to provide the highest level of reliability for conventional, deep and ultradeep water development projects. The last flight to the BP Miller. Today I want to show you the last ever flight to the BP Miller oil and gas platform. Also give you an insight in what happens during a routine Helicopter crew change. The H.L.O gives permission for a flight to land on the deck. Offshore worker, happy to be returning to work. Arriving offshore workers in their survival suits picking up their luggage and leave the helideck. Helideck team get ready the refuelling hose. A Bristows, Sikorsky S92 Helicopter being refuelled on the oil and gas platform. Button her up, time to leave. Hello, today we see the last evening meal that the catering crew served on the BP Miller. Certainly marked a large mile stone for the life of the platform. The O.I.M's place is set. A chilled bottle of blue (non alcoholic) Becks at the ready. Taking photos of the menu. The catering crew produced a fantastic meal. Catering team, proudly showing off their hard work. A couple of images of the platform medic who was also the appointed radiation protection supervisor conducting some LSA / NORM inspections on redundant pipework. Asbestos survey, on north sea oil and gas installation. 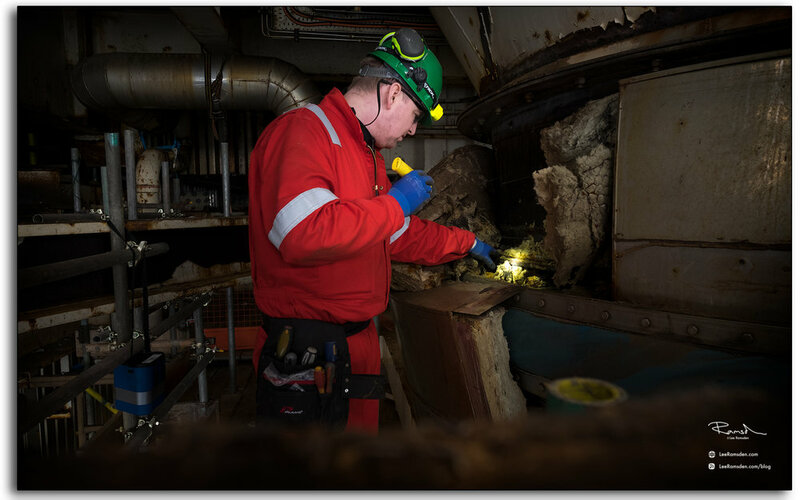 Today id like to show some images of an asbestos inspector conducting a survey of different materials. Today id like to show some of the IRATA rope access technicians that were involved in the decommissioning of the BP Miller. Welding on dead weight supports to the risers. Rope access welder cutting a riser. Long tiring climb back up. Rope techs at height happy in their work. Today id like to show some images of large task involved when safely decommissioning an oil and gas rig. The task is called breaking containment. Where pipework has to be cut or flanges opened, we have to prove what was inside the pipe work previously, to ensure that it is safe via a gas test. To prove that the pipe is safe to cut a gas test is required. As the pipework has not yet been proven safe, all this is conducted under full breathing apparatus to protect the technicians drilling into the pipes from hazardous substances. They put up and take down scaffolding that allow offshore workers to reach higher levels during construction, decommissioning, maintenance or cleaning tasks. 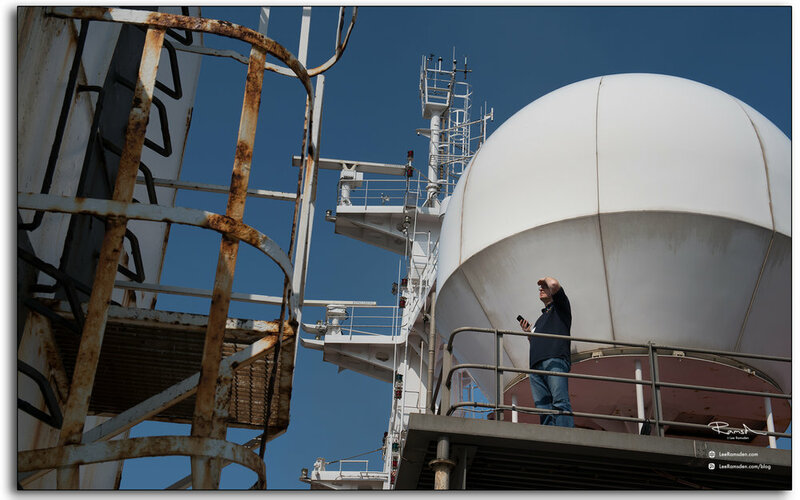 Offshore NDT (non-destructive testing) technician. Here he is testing the quality of the welds to ensure that they will not fail when a large load will be applied. Oil and gas Industrial Medic. This is the platform medic. In the UK oil and gas industry there is a requirement for all installations to have sufficient medical cover and provisions. Treat people working on an offshore oil or gas rig for any injuries or illnesses. 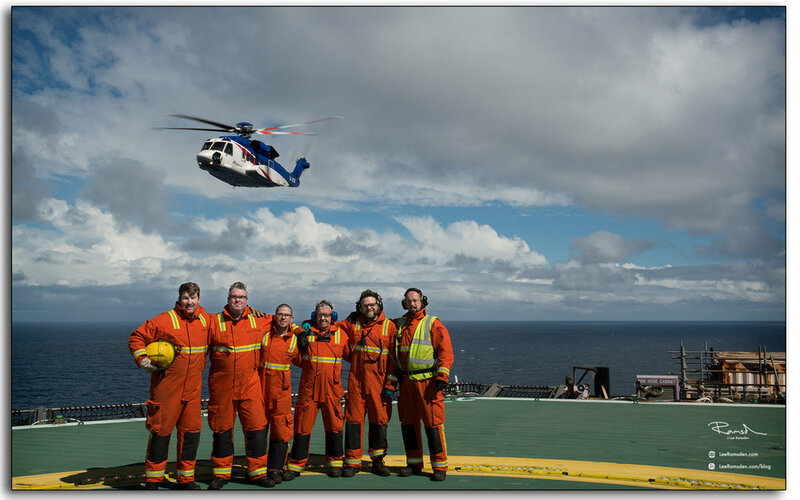 Provide medical care for anyone on the rig or platform who has an accident and make sure that people are fit and safe to work. The health, safety and welfare of all those working on the rig would be the medics responsibility. They also carry out administrative tasks. The medic advises the senior managers if they thought a person was not fit for work or might affect other people’s safety. If someone had an injury or illness that you were not sure how to treat, they would phone the onshore company doctor for advice. Oil and gas industry Tool box talks. Above is a supervisor conducting a tool box talk with his team, on the task in hand. A Toolbox Talk is an informal safety meeting that focuses on safety topics related to the specific job, such as workplace hazards and safe work practices. Meetings are normally short in duration and are generally conducted at the job site prior to the commencement of a job or work shift. It is one of the very effective methods to refresh workers' knowledge, cover last minute safety checks, and exchange information with the experienced workers. Toolbox Talks are also intended to facilitate health and safety discussions on the job site and promote the organization’s safety culture. In the UK oil and gas industry, it is a requirement for a standby vessel to be present. These vessels primarily cover helicopter operations and if any work has to be conducted where there is a potential to fail to sea. (known as outboard work). These vessels sit there, day in day out, no matter the weather they provide us with emergency cover and would spring to life and help rescue if the unlikely event ever arose. Along with practicing emergency exercises, an oil and gas platform regularly tests its emergency equipment. Today we see the helideck fire fighting equipment being tested. Tannoy being given, to warn all personnel of cascading water and that fire pumps are about to start. Technician remote starting pumps from different panels. BP Miller oil and gas installation Helideck. Today id like to show a few single images. In recent times the Civil aviation has instructed for all UK oil and gas installations to install specific lighting set up on their helidecks, if they require flights in the hours of darkness. The illuminated helideck against a North Sea sunset makes for quite an interesting image. Offshore Emergency rope access response exercise. Today we see another emergency exercise. As you can see in the oil and gas industry we regularly drill and test the emergency response plan. It is the old adage - fail to prepare, prepare to fail. It is a legal requirement to have a plan on what to do in an emergency, but does it work? Testing different scenarios on a regularly basis ensures that the plan works, and keeps the emergency response team skills fresh. Todays scenario, is in the above image. In this case we are using an inanimate dummy. But it is to practice how to rescue a rope access worker, working under deck. IRATA rope access technician donning his harness. The rope access supervisor, using his equipment to haul the pretend casualty up to the deck. Platform fire team member safely has hands on the practice casualty. The platform Medic and his first aid team, practice administrating first aid, and using the different types of stretchers required. Platform medic, coordinates the fire team members on lifting the stretcher and places it into the "frog", to lift the practice casualty from the lower levels of the platform, up to the installation sickbay. Fire team leader, in communications with the crane operator. They safely lift the practice casualty to the platform sickbay.